Club Penguin Cheats by Mimo777 Club Penguin Cheats by Mimo777: Exclusive Elite Penguin Force Message! LOOK! At the end of the first row, there's a new crab dude! Maybe it's Klutzy's dad or something! I'd like to find out how they got this message. If I can get it on CP then I will be convinced that it is not fake. the grampa crab he works for them!! i have seen him his blue!! hmm new characters: old crabs = daddy crab? And isnt that PH? The one in the safari hat? May be we might join forces. Sensei will guard, Gary will make a gadget and defend the area, jetpack guy will check the skies, dot will disguise herself and follow Herbert and klutsy, Aunt Arctic will be giving out latest news. I just wish all this would happen. It would be epic. hey Mimo i got that message around field-op 30. the same message and the person kept flashing to someone else all of which you have on the picture. 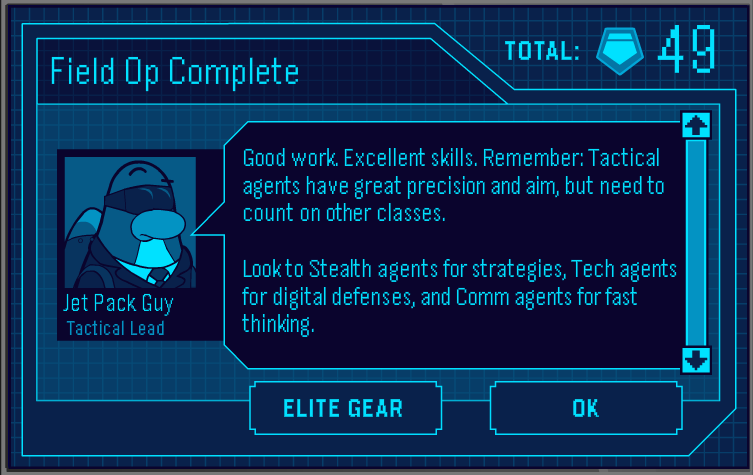 i think it has something to do with a future event the epf will face. Unrelated comment:The news paper wont load anymore. Pls post! but what is that thing in the bottom left corner with 3 eyes? I got this message too! And there were 55 EPF medals when I got it. So this means we all will get this message when we will complete 55th Field Op, nad then after it Herbert will attac the Lighthouse & cause a blackout, just few week left until 55 medals! I think this is fake. I want to see a video on Youtube or something to say, "THIS IS PROOF"
i know herbert & klutzy will attack the lighthouse then rockhopper is probably gonna get lost then sensei will send the shadow or sun ninjas to get rockhopper back the way to club penguin. dood his name is grandad crab and hes goin to be in system defender. he came out in march 2011 and if you search him on google it shows his picture! And Katy perry will give club penguin a consort! In my own opinion. The first group of pictures are the heroes and famous penguins in the Club Penguin. 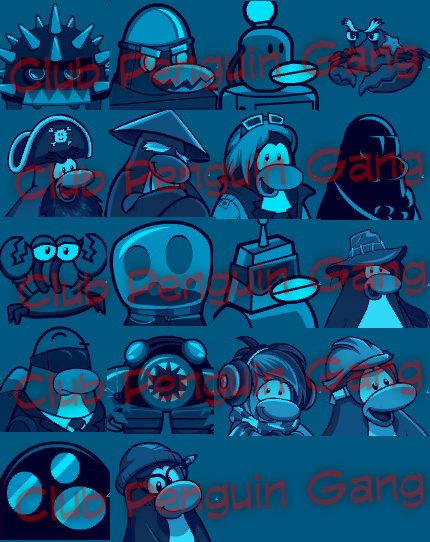 And the second group of pictures are the enemies of Club Penguin. The first message is came from the heroes and famous penguins in the Club penguin. And the second message is from Klutzy whose trying to send the plan to its other mates. Thats where your wrong. It never showed it. And if it did, not like this. And you will see there's a penguin with a helmet. This penguin appears in the mission 11 Veggie Villain. This penguin is trying to repair the telescope in the beacon. Sorry its not from Klutzy, its actually came from Herbert! Ok, I now knew who is that pneguin with a helmet. That's Rory, the Construction Worker. 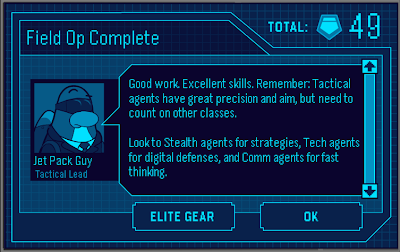 my theory is there could be a blackout at the light house and ALL the mascots will be there and all the epf agents have a meeting and the director reveals him/herself and we play a kinda game like the hydra battle with herbert and then we have to defeat all the enimies and we get like lots of medals. I've encountered this message quite a while ago. I think I've seen this on the 35th field op or somewhere in that area. Mimo you made a mistake! I think Slidoo meant that was going to be a FUTURE field-op message! No one has over 55 elite medals yet! I got it, must be a glitch. Got the new message then it reverted to the old one. 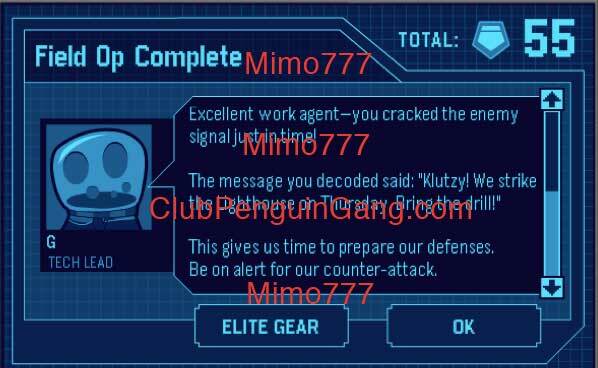 Hey mimo last week I told you about the glitch that you aould still do the previous field op, and I was right about the flashing EPF related penguins/bots! Guess i looked at it wrong cuz I thought rockhopper was one of them. Please post this because you didn't post my last few. GUYS IT'S NOT FAKE! I found a video of it. It's real! The glitch shows you have 55 medals. Then there will be a message from G and in the message, it'll be flashing different characters instead. Mimo, I have a theory. You know on that whiteboard leak how it said "blackout" in June? Maybe they will remove the lightbulb from the Beacon and then Rockhopper might crash again! Hold on,I have now a bit of proof they will attack the lighthouse,AND THE COVE!Sorry for the capitals but seriously. it shows three rooms with a lift in. Message shown says "Klutzy,lets attack the Lighthouse on Thursday,bring the drill!" Lighthouse is a location with the lift. So the cove maybe attacked by Protobot. This is NOT fake. However, this is MOST LIKELY not going to happen. A lot of penguins got this in March, April. Some got it before. Some got it now. I do not think this Lighthouse attack will happen because of the fact there's no ACTUAL THURSDAY it will or has happened on. It IS also a glitch because of the flashing penguins. Who's the penguin on the 3rd row to the right (4th photo). I THOUGHT THAT WAS G BILLY! And what is the thing at the bottom row 1st photo? I want download for free XRumer 7.0.10 ELITE? ?